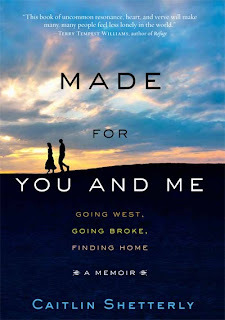 HALLIE: Just in time for Mother's Day and the perfect gift is Caitlin Shetterly's new memoir "Made for You and Me: Going West, Going Broke, Finding Home." It's a terrific mother-daughter (and mother-son) story about ties that bind us, creating an emotional and often physical safety net. It's also a story that is a writer's dream: a blog that goes viral. They say that success in this life is about timing, and Caitlin's memoir tells of her own colossally bad and good timing. Bad timing: the writer and her husband Dan, a photographer, packed up their dog, cat, and belongings in hatchback and drove Maine to Los Angeles with big dreams of success. More than a year and a baby later, they threw in the towel (I've never heard it as sponge--but either is fine with me! ), defeated by the recession, and drove home to move in with Shetterly's mother in Maine. Now comes the good part: Along the way, Caitlin blogged about their situation for NPR's Weekend Edition. The response was overwhelming, and led to a contract to write this book. She and her husband were down to their last $16 when she got her advance. Welcome to Jungle Red, Caitlin! I have the sense that you are, by nature, a fairly private person. Have you always written a journal? CAITLIN: Thank you for having me! Honestly, I'm a terrible journal keeper. I mostly just write illegible ideas down--or lists of things I want to remember (like groceries and then something my son said on the same wrinkled post it)--and then I have to try to figure out what the hell I was talking about! You're right about me being private--even a little shy. But when I write I let it all pour out of me. 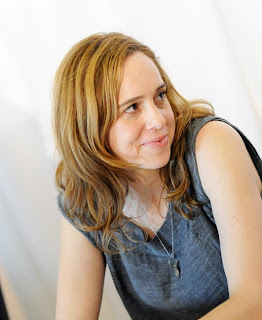 HALLIE: How was it to write about (and publish!) such a painful experience? CAITLIN: I believe that being an artist--for me--is about telling the truth. And when you're writing it's so private you aren't thinking about the publishing part. So, I just lived it as I was writing it--which was, of course, hard at times because I sometimes sat there with tears cascading out of my eyes. But I also made myself laugh out loud, too. The work of being a writer, in this case, was just another part of the journey. HALLIE: When did you realize you'd struck a nerve with your blog? CAITLIN: When my first audio diary aired on NPR. I had no idea that so many people would be touched by our story and that it would, as they say, "go viral" and that I'd become, overnight, the human voice of the recession. I had no idea that people all across America would offer my family plane tickets, land, money, places to stay, meals. We didn't take anyone up on any of these gifts, but we were so moved by the great heart of Americans. HALLIE: Were you surprised by the response? CAITLIN: I was so surprised! I was just doing the work of making the audio diaries and writing my blog--and I was trying to do them with honesty and love. I had no idea thousands of people would react to my story. HALLIE: You became pregnant when you got to California. And it was a difficult pregnancy. It seemed like an impossible complication in an already hard situation; and yet it turns out to have been such a blessing. CAITLIN: Motherhood is the best thing that every happened to me; it was the grace that saved me during a tough time. My mother used to say "Gifts always come in packages we don't expect." This is true and I live by these words now. And, of course, in the book I come home as a new mother and move in with my own mother! HALLIE: I really enjoyed reading the pieces in the book about food and swimming. Seems like you have a special relationship to each. CAITLIN: I grew up on the coast of Maine, so water is in my being. I could never live in a landlocked place. When I get in the water, I feel alive in a way I don't anywhere else. It's almost like I go into some nascent state. And, of course, I swam during my pregnancy, too--talk about nascency! Food is also a big part of my book--I throw recipes into the story, things I love to eat, things my family makes, etc. Food is such a part of all of our lives, I wanted to include it naturally as a part of the conversation. HALLIE: How do you think the experiences you lived through changed you? CAITLIN: When you have a child, it's amazing, you laugh every day. I don't know that I laughed once a week before I had my son! Now, I laugh all the time. And, also, I learned to smile and laugh even when things are hard. In fact, I made a goal out of smiling at strangers when our lives were going to hell in a hand basket in LA. Smiling surprises people but it makes them and you feel good. And, also, I learned something really beautiful being home with my mother. When we were staying there she would get up every day and say, " I love this day." I had no idea why anyone would do such a thing!! But now I try it...and it really works! Thank you for having me Hallie! It was such an honor!! HALLIE: Caitlin will be here all day so please, join the conversation! Hi Caitlin, what an interesting story--thanks for visiting us here! Since I'm not familiar with your work (yet), wonder if you could tell us something about what the draw was for LA--and how it feels to be back in Maine. What do you see in your future? Your mother's quote about loving the day is a great idea for all of us! I think we went west just like generations of Americans have gone before us--to seek our fortune and try our hand at in larger playing field. That said, it was very early in the recession--at Christmas 2007 my husband's full-time job as a commercial photographer had been put to part time. I don't think anyone knew this "downturn" would turn into a Great Recession at that time--so we just figured we'd go west and follow that green light that year by year...you know the quote! But of course, we don't have to go very far back in history (or literature) to read of other such stories....and how they have sometimes gone. I also love: "Gifts always come in packages we don't expect." My mother's mantra was "take notes." LA is such a different world--I'm always struck by how it SMELLS different. Between the eucalyptus (cat piss), or the sweet-sweet of orange blossom and jasmine, it can be overwhelming. Caitlin, I completely got your description of dealing with that on top of the all-day (not just morning) sickness. how inspirational...and it shows you no matter how much you plan and attempt to figure things out...what you plan is probably not gonna happen. And the exciting thing is when you allow yourself to realize that's a good thing! Congratulations...do you look at "the future" in a different way now? Nothing like a DARKEST BEFORE DAWN story to give one hope. Thank you for this great interview. Thanks for coming to Jungle Red and telling your inspiring story. I guess the world responded to your truths -- that's so terrific to hear. I totally relate to the not being able to live in a landlocked area. I get freaked out every time I visit my mother-in-law in Arizona because its HOT but there isn't any ocean. Makes me squirm. Thrilled about your good fortune! Hallie--I, too, love that my mother always said that. it' so true isn't it? Whenever I imagine what I want a gift to look like....it's never what i get! And, yes, I do look at the future differently--I'm more flexible. I just don't assume things will go such and such a way. That doesn't mean the road isn't hard still and I don't get disappointed, I do! But I bounce back better and just say to myself, "You know what, you are more than the sum of your mistakes! And wonderful mysteries and gifts always come down the road as long as you stay open." So I try to be as present as I can so I can gain all I can from the loveliness that often surrounds us. Love, C.
E.J. Copperman: Who was that masked man? Are We Ever REAL Writers?